I know you're looking at the photo and wondering, what the...? This is a loading dock I had to inspect on Thursday. "So," you say, "What is so profound about this?" It's clean. It's spotless. It doesn't smell. You could probably eat off the floor, it's that clean. I have been in loading docks all around the Chicagoland area. Some are tidy. Most are what you would expect, clean, but have the hustle and bustle of deliveries. Some are downright "ewww". They are the kind where I contemplate burning my shoes after having to inspect them, when you hope that sticky spot on the floor is residual soda and not something else, where the rats won't even go. This was the exact opposite. Doug and I walked into this room and were amazed. It was spotless. The building engineer followed us in and accepted our compliments. "I like it clean. What can I say?" It took us a few minutes to get going because we were quite speechless. 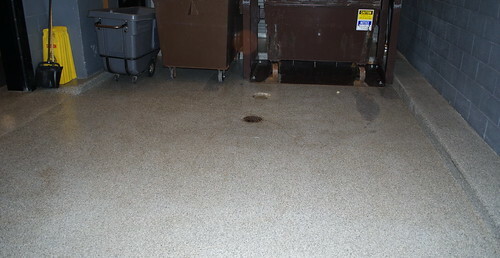 Not every place could keep their loading dock as clean as this, but I am going to remember this one. Yes, sir. I Do Launder Money. This Vexes Me #10 and #11. Cake for Brea...lun...supp...Oh Heck! Anytime! Power Outages are Good for Something.